The Google Apps suite allows for collaboration with just about anyone. You’re probably already well versed in Google’s Apps collaboration, shared documents, and cooperative editing. There’s one small downside to this new shift in working where others can edit your documents anytime they want from any device they want. How do you know when a document has been edited? Checker Plus for Google Drive was developed to solve that problem. This Chrome extension watches your Google Drive for any changes made to a document, spreadsheet or presentation. When you open the extension, you’ll items in bold that have changed since you last opened them. Additionally, you can go into the extension options and choose to be notified when files are changed. You can set it to monitor your entire drive or just specific folders. 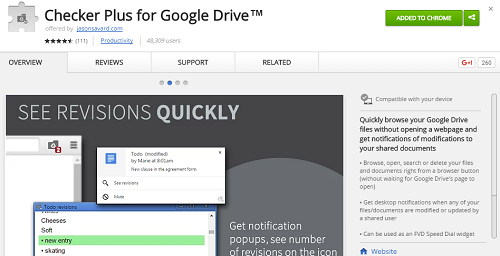 The more you use Google Apps, the more you’ll see what a difference this extension makes. Looking for more classroom tech tips? Check out our weekly web Wednesday tips.